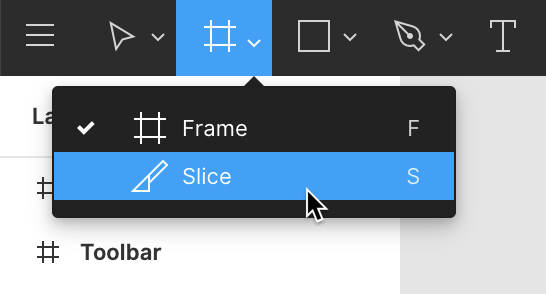 The Slice Tool is also found under the Region Tool dropdown in the toolbar. Slices allow you to specify a specific region of the screen for export, even if they're not organized into a single group. Just drag a slice around the region you want to export, and add an export setting to the slice object. With "Contents Only" enabled, the Slice will export its parent layer and the children of that parent. With "Contents Only" disabled, anything that overlaps the slice will be exported. These are useful, because you can quickly show/hide them all, and they can be grouped outside of other content or placed at the top of the layer stack. Slices also let you control padding. Otherwise the padding is computed from the overall shape bounds. The latter adjusts when the shape changes size, whereas the slice is absolute. Frames are similar to slices, but Frames typically contain and clip the child layers, have a background, effects, etc. Slices are just a lighter weight rectangular bound that exists outside of the hierarchy for exporting.